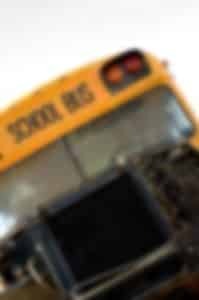 Deadly Bus Crash Accident - Pulvers, Pulvers, Thompson L.L.P. This morning, a school bus and a garbage truck had a fatal crash shortly after 8 am on route 211 in the Hudson Valley town of Wallkill. The school bus had just left the Harmony Christian school after dropping off all the children on board for the day. The bus driver, Raymond Lucca was declared dead at the scene by police. Caesar Leon-Sanchez, the truck driver, was flown to Westchester Medical Center for serious injuries, but undisclosed injuries. From pictures shown in news media coverage, we can see that the front end of the bus owned by the First Student Bus Company was severely crushed by the garbage truck, an International Harvester. Specifically, it appears as though the engine compartment was compressed into the driver’s seat of the vehicle. At the time of writing this post, the Collision Reconstruction Unit is still investigating the scene on Route 211. However, it has been indicated that it appears as though the garbage truck was traveling in the westbound lane before it edged over into the eastbound lane where it fatally struck Lucca’s bus. It remains to be seen what may have caused the truck to drift as it allegedly did.